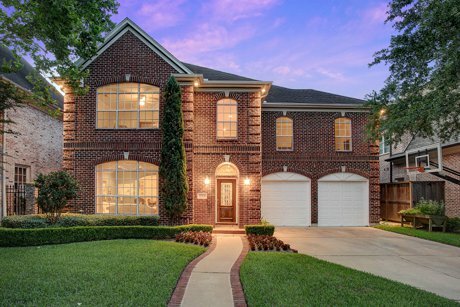 3754 Robinhood Street | SOLD in West University Place, TX! 3754 Robinhood is a stately property located in the desribable 3700 block of West Unviersity Place. This four bedroom, three and a half bath home includes features such as formal living and dining rooms, an island kitchen, and a gorgeous backyard living area with a forty foot heated saltwater pool with spa, an outdoor fireplace, and pergola. Hardwood floors downstairs, high ceilings, crown moldings, and extensive windows. Formal living room with wall-sized windows. Formal dining room with chair rail. Kitchen remodeled in 2016 with Solarius granite counters, tumbled travertine tile floors, high-end stainless steel appliances, and custom cabinetry. Kitchen-Aid convection double ovens and microwave. Jenn-Air five-burner cooktop. LG French door with drawers refrigerator. Bosch dishwasher. Breakfast bar seating plus room for a table, opens to family room. Family room with wall of built-in shelving plus storage closets. Granite surround custom wood or gas fireplace. Six floor-to-ceiling French Windows overlooking backyard. Master bedroom suite with coffered 10' ceiling, built-in headboard. Master bathroom with separate vanities and sinks, jet tub, separate shower, two large closets. Backyard living with custom textured concrete deck, pergola, outdoor masonry fireplace, built-in swing, mosquito control system, 40' heated salt water pool with spa and diving board. Completely re-landscaped in 2011, full sprinklers. Gravel area for grilling, smoking, and crawfish boils.